All these forests did provide beautiful areas for wild camping. It was really easy to find areas where nobody would see us. Some areas really exuded a nice feeling of being outdoors together with the wildlife, the hares, the deer, etc.. Finding a beautiful spot when the sun is setting is just the best feeling there is. One afternoon we had been searching for a spot for quite a while. Our app on the phone pointed out that behind a small part of forest there should be an open patch. We cycled through and it felt like paradise! It was a great place to set-up the tent. A bonus also in most forests were the blueberries that we found along the way covering the ground of the forest. An important milestone for us was that we have crossed Europe for the second time!! 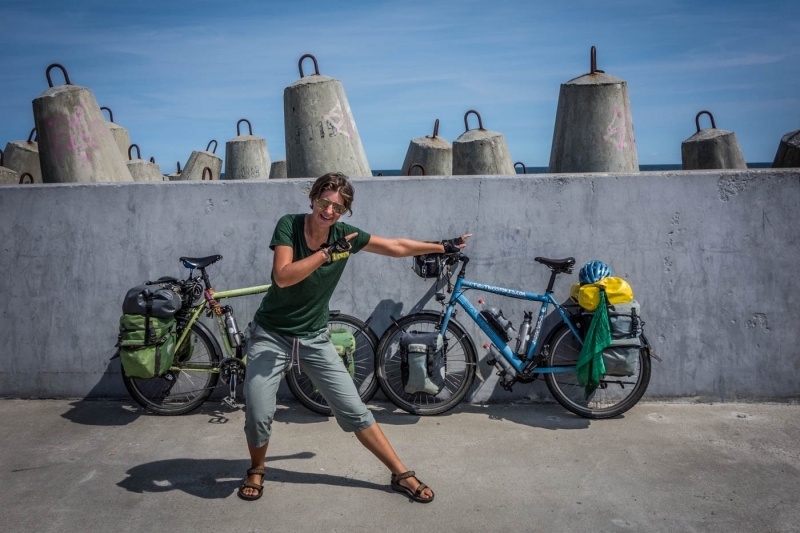 We cycled from Istanbul to Kolobrzeg, from the Mediterranean sea to the Baltic Sea! We reached Kolobrzeg with the plan to take a ferry from here to Nexø on Bornholm. Bornholm is a Danish island in between Poland and Sweden. What we didn’t know is that the ferry only runs 6 out of 7 days and unlucky enough we arrived just the day before the ferry didn’t run. We thought about alternatives. Kolobrzeg is a town in which many local tourists have their holidays and we were here beginning of August. We decided to stay for two nights at a local campsite. Eventually we did make it onto the ferry. Tip for you – you should never (really never) eat blueberries without washing them before. Foxes pisses on blueberries (sorry for being so primitive right now) and eating such contaminated fruits will give you bąblownica (unpleasant disease). I am cycling now in Corsica. I cycled in Czech Republic, Austria and Croatia 3 years ago. I found that the Czech drivers have contempt for cyclists. On the quietest roads, some drivers just missed hitting my handlebars. I was fed up with their dribing behaviour. What do you think of the Polish drivers?